I have been studying abroad in Barcelona, Spain for 12 days and I am loving every single minute of it thus far! I’ve met some great people from other universities across the country and from across the world who are living with me in the same residencia. The first week we were all getting to know each other but a lot of them are in my classes and this past weekend we all traveled together and this upcoming weekend we’re travelling again, I’m so excited. Starting from my last post A LOT has happened and I can’t believe it’s going by so fast already, it feels like I just got here and also feels like I’ve been here forever. This past weekend we traveled to both Sitges, Spain as well as Valencia, Spain. Both places were an absolute blast and I enjoyed touring the city as well as the beaches that were in both cities. Everyone was raving about the “paella” that is in Spain, which is basically a mix of rice, vegetables, and some type of meat or seafood, and the best dish I’ve had thus far has been from Sitges. If you have never tried paella, I would highly recommend it because it is absolutely wonderful. While in Sitges we also toured their cathedral as well as the beach, which was beautiful. After the Sitges trip and in between my classes, which I really enjoy by the way, we had a your of La Sagrada Familia in Barcelona, and let me tell you this was one of if not the most impressive architectural designed buildings I have ever seen in my life. The detail that this church has everywhere you look is stunning. The master behind La Sagrada Familia’s fascinating work is Catalan architect Antoni Gaudí. This Roman Catholic church has been in construction since 1880, which goes to show the amount of detail put into EVERY single area of the church. The projected completion date of the church is in 2026, which is the 100 year anniversary of Gaudí’s death. The church is 170 meters tall and can fit up to 14,000 people, which was what Gaudí was intending, but can only fit 6,000 comfortably. This architectural masterpiece is definitely an icon in Barcelona and a huge tourist area, and if you come to Barcelona at any point in your life, La Sagrada Familia is a must visit. Later in the week our residencia visited the beach multiple time and also went to Las Ramblas, which is basically a giant shopping center for tourists, locals, and anyone else who wants to visit the area. Shops stretch for 3/4 mile and you can find so many different types of things be sold from gelato, FC Barcelona gear, restaurants, and shops of so many things. On the way there, we stopped past the Cathedral in Barcelona which is gorgeous as well. We didn’t get the opportunity to go inside because we wanted to be able to walk around Las Ramblas, but I plan on going back again and checking it out because it is fascinating and looks very interesting. 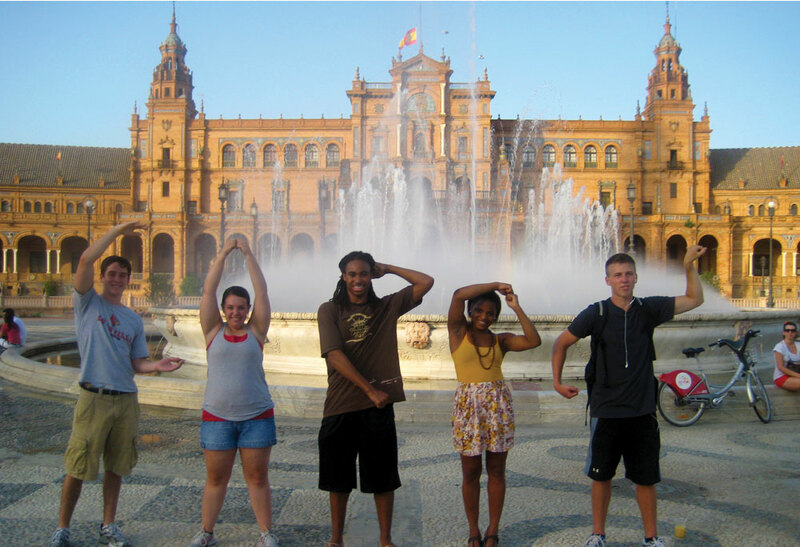 This past weekend a lot of the people from our residencia went to Valencia, Spain and got to tour the city. A lot of the buildings differed from Barcelona, they were a lot more modern which surprised me because Valencia is Spain’s 3rd largest city behind Madrid (the capital) and Barcelona. Another cool thing was the parks and gardens throughout the city which were beautiful, there was so much to do there that we couldn’t fit it all in during 1 and a half days. The one thing I wish I could have done was gone and see a bull-fighting ring live, and I really want to do that before I leave Spain this summer because I feel that would be such an awesome experience. This upcoming weekend we are traveling to Amsterdam in the Netherlands and Brussels in Belgium. We’re still trying to figure out all the plans as to what we’re going to do but one of the people who lives with us has family in Amsterdam so I’m sure that they can give us some interesting places to visit and see, so I’m really excited for that this upcoming weekend. On that note, I have a presentation tomorrow and need to finish the rest of the project so I have to get off here. It’s crazy how fast time flies over here when you’re having fun, but I’ll be sure to post this time next week!